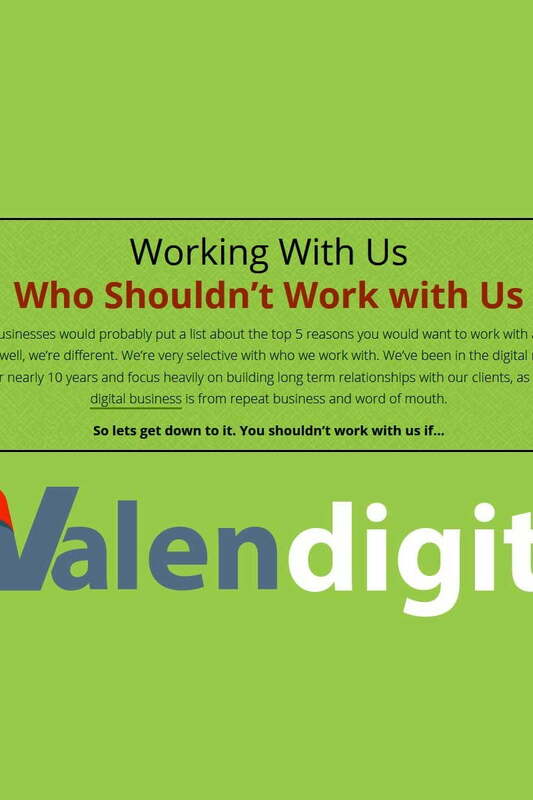 Many businesses would probably put a list up about the top 5 reasons you would want to work with a digital agency, well, we’re different. We’re very selective with who we work with. We’ve been in the digital marketing industry for nearly 10 years and focus heavily on building long term relationships with our clients, as most of our digital business is from repeat business and word of mouth. 01. You’re looking for the cheapest agency. Were not the cheapest but we are not expensive either. To be crystal clear, were definitely not the cheapest digital agency. If you’re not looking to invest in your business that could and should bring you ROI, then were not going to be a good fit. Our aim is to provide value and deliver way more for your business than what you would expect from any other typical digital agency. Your so busy that cant be a part of your website & even to communicate. Just because you have a website you should not expect magic to happen. The success of any website is heavily dependant on the participation and communication from the business owners! Be it via email, phone, skype etc.. you should be readily available to discuss your online business. Help us to allow us to help you! 03. You don’t pay on time. It’s an issue for you to pay for work on time! Ensuring that you can pay on time at agreed dates. When we agree to work together, we’re building a long term relationship based heavily on trust. When delivering work for your projects we expect to be paid on time. We’re sure that you expect the same from your clients and we are no different. It’s disappointing to have to chase payments for completed work on complex digital projects. 04. You think you can do that. ‘I did a design course’ that now makes you an expert. Our focus is ensuring your website looks good but with best practices, leads, conversion etc.. in mind. UX/UI design is so much more than what looks nice and what doesn’t. We apply reasoning and use data to determine what does work and what doesn’t. There’s so many factors involved in the process and we have years of experience in getting it right. Changing your mind on every design element and colour because it doesn’t suit you isn’t going to work. If this is something that describes you, then you got it, we wont be a good fit. 05. You need a ‘minion’. You need someone to do whatever you want behind a keyboard. Some people are control freaks, we understand. Those that want full control over their digital projects when there business model is something completely different, are not who we like to work with. Your not going to be a good fit with our business. Your experts in your business and we are in ours. 06. You think ‘Web’ work is easy, isn’t it? Creating a website, putting together strategies and even creating graphics is sooo simple! Don’t take it the wrong way, but thinking that ‘web’ work is easy is just plain rude! There is so much that goes into designing, coding and development etc.. its not as easy as it may look. Well ‘cant you just..’ its not as simple as that. Every project involves some type of logic, code, styling, implementation etc.. that ultimately takes time. Its not a simple case of ‘flipping a switch’. NONE OF THE ABOVE APPLY TO YOU? YOU WANT TO WORK WITH US? GREAT, COOL! So none of the above describes you? or your business? Your looking for a breath of fresh air and now you have found it. If you haven’t already noticed we have a personality here, chilled out but still professional. Life’s to short not too smile. Trust us, trust the professionals to get your project done for the best results. If you get a smile and personality with that too, well its not the end of the world then is it?